The internet is often perceived as something you have to shield your children from. But, as a generation adapting to technology, it’s all about finding the balance and knowing where to look to make the most out of it. The best educational sites for kids can help you teach and grow with your children, reaping the benefits of technology. Of course too much screen time can have a detrimental effect on your kid’s health, but it can also be used for good too. Divided into animations, books, games, puzzles, songs, coloring and printable materials. You can track progress based on how many activities in each category are completed, or by academic level. Their “Tickets and Rewards” can be spent to buy new items for the virtual classroom, which teaches your kids valuable lessons about saving and spending. This website is subscription based and costs $9.95 per month, but only $4.99 if you choose the annual subscription, and has a month-long trial period. BabyTV is a 24-hour TV program for babies and toddlers developed by FOX. It’s filled with educational shows, songs, and games, and has a day and night schedule. The daytime schedule is engaging and active, and the nighttime schedule is calm, with soft music and visuals to help put the kids to sleep. All the shows and songs are available online on demand from their extensive library. Their content is divided into useful categories such as “Songs & Rhymes,” “Bedtime” or “Activities” to make it easy to find the right type of content. Funbrain is the hub for educational games for children from Pre-K all the way to 8th grade. The website is filled with books, comics, videos, games that help children develop their literacy, problem-solving skills, and math. All the games have great “how to play” sections to help out. Funbrain is a favorite of parents and teachers because it puts children’s security first by not collect any personal information from kids. Note: one thing to be wary of according to reviews is the ads that appear on the Playground section of the site, but this can be solved with a good adblocker. Curious World is an app that helps prepare kids for kindergarten with a wide selection of books, videos, and games. You can choose titles based on age and customize it to your kids’ interest and needs. Simply choose the subject you want your kids to learn about. This app is currently available for iPhones, iPads and Apple TV only, but an Android version will release soon. It’s a subscription-based app that fully unlocks for $7.99 a month. For this price, you will get access to customization and tracking options in the Grownup Dashboard. If you choose the annual subscription, you will save $30 per year. What better site to learn about animals than Natural Geographic? This website helps your young explorer learn about the world and how it really works through valuable lessons in book, video and game format. You can also subscribe to magazines, buy books and learn about events nearby. Their National Geographic Kids Magazine is praised by many for the high-quality content, so you might learn a thing or two yourself! Popular among adults, Duolingo is also a great language learning site for middle schoolers that nails how gamification works. Each language lesson is a level to complete before you can move on to the next. Kids stay motivated through features like streak count that tells them how many days in a row they completed lessons. There are currently 33 languages available for English speakers. Duolingo is also available for classrooms to bring language lessons to a whole new level. The best thing about it? It’s free, and you can learn on their website, or install apps to your phone or tablet. This public learning laboratory is a great resource for kids and adults alike. This website is a repository of interesting activities, apps, blogs, videos, and other websites, that can all be browsed by topic. The list of topics is extensive, and features everything from fine arts to space exploration, from engineering to cooking, from optical illusions to sports. You can also visit their laboratory located on Pier 15 in San Francisco with your kids if you happen to be nearby. Starfall is a website focused on teaching phonics-based reading to kids through games, animations, and stories. It is highly praised by parents and teachers for its level and progress setup, with special attention to incentives and rewards for completing lessons. Their lessons are all backed up by educational studies and research. Kids can practice pronunciation, word recognition, and reading comprehension. The website is free to use but also features a paid membership that gives you access to even more content and lessons. 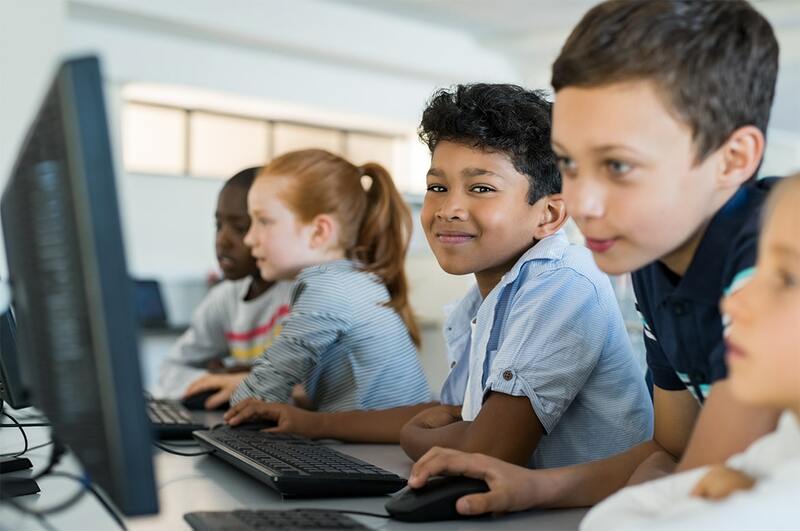 Coding has become an important skill that’s good to have, and with the direction, we are going in, it’s bound to become an integral part of literacy in the future. You can help your kids from early on with Code.org, a website that offers various short lessons and tutorials to get your kids interested in coding. Your preschooler will love PBSKids.org thanks to lessons and videos featuring well-known characters from PBS shows – Curious George and Cat in the Hat will help your kids master new skills through fun games. Most of their apps have special Parent-Child Activities that help you bond with your kids while playing too. Calling themselves “a launchpad for curiosity”, BrainPOP is divided into various topics to help kids grasp complex concepts. While developed for children, BrainPOP is also focused on educators and brings tools optimized for the classroom. You can choose topics about science, English, math, health, arts, music, even engineering, tech, and social studies. The website is subscription based, with prices varying on the type of subscription: you can choose between Home and Homeschooling, while educators can opt for classroom, school, district or virtual school options. Even though this has been a touchy subject, knowing about the weather, climate, energy and how all of this affects plants and animals is important. Climate Kids by Nasa.gov helps your kids learn everything about it through fun games, videos, and activities. Whiles this is basically a game, the concept is awesome. It’s a virtual world your children can explore while remaining completely safe from any hazardous behaviors often associated with these types of online games. All quests and stories in the game are based on real life facts, so kids will learn valuable lessons while exploring new and interesting islands with their in-game avatars. This website makes space exploration even more exciting for your kids, through super fun videos, games, quizzes, solar system builders, music and worksheets. Your kids can learn all about space, our solar system, the stars, galaxies, and space exploration. You don’t have to visit all these sites, just find the right ones to suit you, and you’ll be able to use technology to bond with, and educate your kids. One word of advice – all of these websites are heavily focused on videos, which could quickly eat up your bandwidth. Choose an ISP provider without data caps to ensure your kids have access whenever they are up for another lesson! Subscribe to The Mother Huddle Newsletter for new posts, tips, deals and more! Let's stay connected! The Mother Huddle is a parenting and lifestyle blog featuring DIY craft ideas, kids crafts, free sewing patterns, tutorials, recipes and more! @2018 -The Mother Huddle. All Right Reserved.